At the end of the 15th century a group of master potters came from the great pottery manufacturing city of Montelupo and set up kilns at Cafaggiolo. Soon they were making the the most magnificent ceramics ever produced in Europe. This fine maiolica is found today in all major ceramics collections around the world. Pottery produced at Cafaggiolo is distinguished by the potter's mark SP (right), for Stephano and Piero di Fillipo, whose family ran the workshop for a century. The photo at right shows some fine examples of the ceramics manufactured at Cafaggiolo and some of the native clay used to make them. One of the larger sherds contains part of a Medici family crest, once thought to distinguish Cafaggiolo ceramics before it became known that the Medici had nothing to do with the workshop, but commissioned pieces like everyone else. I find the blue glaze pieces with their distinctive designs most appealing. The clay was taken from a trough at the bottom of one of the excavation trenches. We had the pleasure of working with two ceramicists, Alessandro Alinari, the major expert in the world on Cafaggiolo ceramics, and Dr. Anna Moore Valari. The photo at left is an example of the many, many ceramics sherds we found during our excavations. 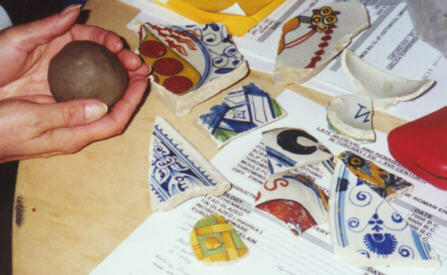 Most of the pieces were "kiln wasters", discarded because of defects found during the multi-firing manufacturing process. Many maiolica fragments were found including a surprising number pieces with gold luster. Three kinds of slipware were found: incised, painted, and marbleized. 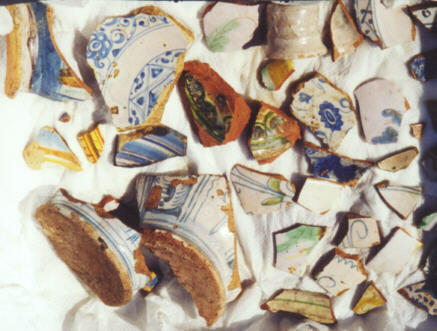 A number of lead-glazed terracotta kitchenware fragments not made at Cafaggiolo were found in one location, probably filled with the contents of the villa refuse dump. Several items shown below were used in ceramics manufacture. Iron and copper scrapers were used to produce the designs and "stilts" were used to separate the pieces piled in the kiln. Pottery manufactured this way shows small imperfections called "pulls" where the stilt contacted the surface. and in the center, part of a ceramic "basket" used to hold coals to warm a bed. This page and its contents © Copyright 2001 Michael & Karen Crisafulli. All rights reserved.